Heart of Evil is the second book in the Krewe of Hunters series by Heather Graham featuring a team of paranormal, forensic investigators that bounce from one location to the next solving crime. Heart of Evil takes us to the Louisiana bayou-country, where an old plantation is experiencing sightings of hauntings and terrible murders. Ashley Donegal runs Donegal Plantation, also an historical site of the Civil War, where tourists flock annually to watch re-enactments. When a body turns up dead on the plantation grounds, Ashley's grandfather calls in a special task-force comprised of members with special paranormal intuitions to investigate the murders. One of the investigators named Jake Mallory coincidentally happens to have a romantic history with Ashley, making everything more intense than it already is. Nearly the entire line of romantic, paranormal suspense novels by Mira are extremely similar to one another. While these novels are predictable and far-fetched, they are definitely entertaining when you're in the mood for an easy, distracting read. I like how Graham intersperses short, creepy chapters from the killer's point of view without revealing too much because they definitely add a spooky element. I also get a kick out of how the heroines in these novels are always disheveled, do lots of sweaty hard work and then freak out over stumbling upon dead bodies -- but are always described as being stunningly beautiful. O-kaaay, whatever you say! 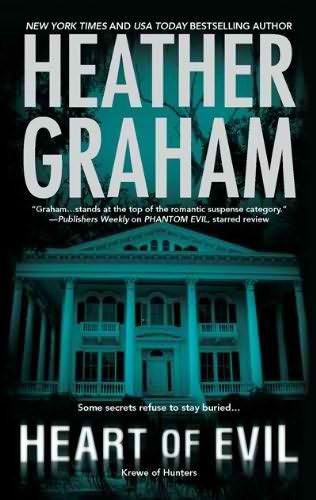 Heather Graham 's novels are like toned-down, tamer versions of John Saul books intended for female audiences and can serve as a great escape, but by no means would I consider it must-read material.